Often times readers will read a book and then reach out to the author. I am always honored when a reader takes time to read and reflect on my writing. Recently, I received a particularly heart-felt letter from a reader, Lisa Bhatt. She asked if I knew how beneficial storytelling can be for those who have dementia. Lisa learned this from her own experiences with her mother. I was very intrigued and asked Lisa’s permission to share her letter. Before you read Lisa’s letter, you might want to know that she is working on a Master’s in Library Science (MLS) and plans to finish this spring (2019). Prior to studying Library Science, Lisa was an attorney. I have never met Lisa, but after reading her thoughts, I feel like I know her. Lisa, thank you for sharing with all of us. I am sorry for your pain. I just finished The Power of Story and thoroughly enjoyed learning, in particular, of the benefits of stories with immigrant students. Along the same lines of identity texts relating to students, I want to point out the immense benefits of stories with dementia patients for enriching, engaging, and soothing. As I write to you, my mom (a librarian) is dying from progressive dementia. Throughout our very difficult 7 year journey, reading with her has been the single most important tool to ease her high anxiety, to provide comfort and allow her to escape dementia at least for a moment. My mom used to hide under her bed with a flashlight to read when she was 6 because her dad didn’t think girls needed to know how to read. Stories have given her comfort her entire life. She especially enjoyed Patricia Polacco and other authors who brought back memories of her own Russian heritage. I have felt the very real power of stories to improve the quality of life–especially in the impaired, distressed, ailing older adult. Because of my experience with my mom, and great desire to propel libraries to offer widespread outreach programming to seniors, I will finish my MLS degree this spring–for mom. Thank you for your book. I will use the lessons learned as I share and facilitate stories with seniors in the years to come. Over the years, my mom has particularly enjoyed books by Tomie dePaola and Mike Venezia which are children’s books that speak to her love of art and God. In the next WinkWorld, I will write about one of my favorite Patricia Polacco books, Aunt Chip and the Great Triple Creek Dam Affair. 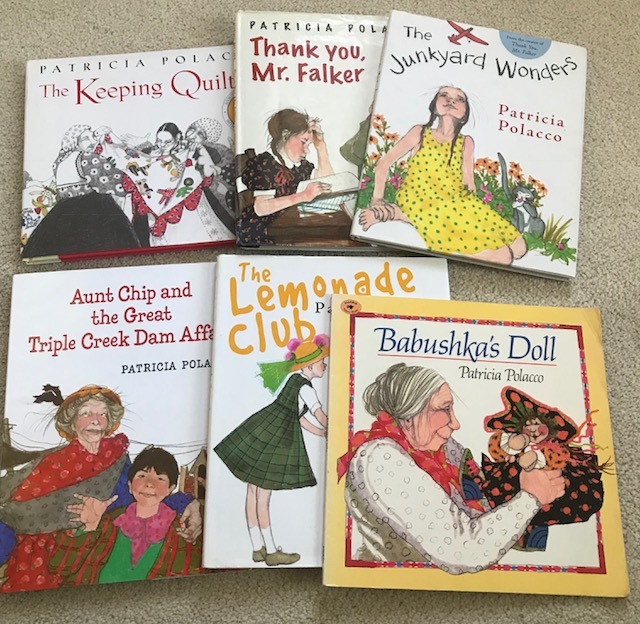 Some of Patricia Polacco’s magical books. What a wonderful topic! It is true that dementia patients often settle well (if they are agitated) using music and singing (old songs from their youth, especially)…of course medications like Haldol work too, but distraction and reminiscence is effective many times. It seems almost everyone enjoys being told a story or to have someone read to them. What a great idea to use literature! You are so incredibly productive and contribute to the world in a variety of wonderful ways! I am grateful to be your friend….for these past 42 years! Thank you, Nancy, I know that you have spent much of your career caring for similar patients and their suffering. Thank you for sharing. And, yes, here is to 42 years of friendship! Love.